When a Boeing 747 drops out of the sky with the men of the Cartel aboard, the women of the family have to step into their own. With the federal government on their heels and the family on the brink of destruction, a female dynasty is born. After the government’s case is thwarted, the ladies plan to take the family legit. They head west to establish a new endeavor, but with new territory come new problems. The Carter family name doesn’t ring as loud as it did in Miami. It’s a new set of gangsters and a new set of rules as the Cartel finds problems with an Arabic millionaire. Even as the new Cartel struggles to go legit, trouble always finds a way into the family’s circle. Larceny, deceit, and murder are all in the cards. 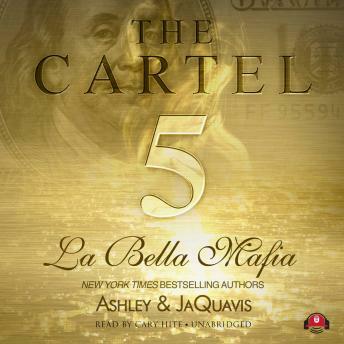 The Cartel 5 is a page-turning thriller that promises to deliver. This mafia family tries to go corporate, but the streets won’t let them. This is the rise of the female Cartel: La Bella Mafia. Out of all the novels written with this series, this was the absolute best. I really love The Cartel Series. Everybook will have you on your toes.. I can’t get enough!!! Love it! !